Nancy Standlee is an Arlington, TX, award winning contemporary artist who has a hard time choosing her favorite medium. She paints cheerful and joyful paintings with bold expressive color in oil, acrylic, mixed media and collage. 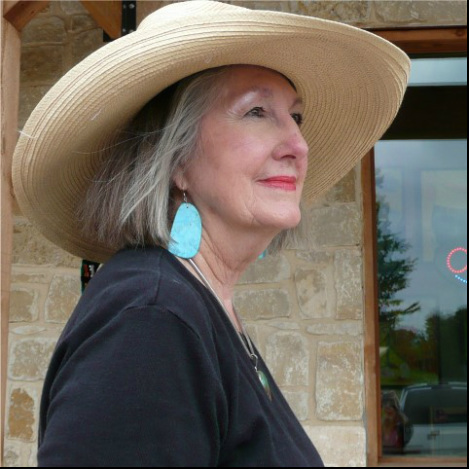 She has degrees and certifications from several Texas universities, Tarleton State University, University of North Texas and Texas Woman’s University but she continues to learn about art through travel and art workshops in the U.S., Europe and Mexico, DVD’s and books. Nancy teaches art journaling workshops with watercolor and high heel collage workshops using the torn paper method. She is a signature member of the Society of Watercolor Artists in Fort Worth. She keeps a blog and contributes to several other blogs, belongs to a collaborative painting group, Canvas by Canvas, published an article on collage for the Empty Easel site, and was published in 2012 in the popular book Painting with Mixed Media, Guhin and Greenman, 2012, "Frida", page 117, "Texas Cactus", page 118, "Jessie", page 119, bio, page 129. Nancy is involved in some type of art related activity each day. More paintings can be seen on her online gallery at Daily Paintworks. She has recently published an affordable ArtByte , a collage tutorial on the Daily Paintworks site. She appreciates reviews. Also, she has opened a new shop on Etsy and click HERE to see some of the items in her shop.